Occupational therapist Kristi Repp talks to Cpl. Justin Gaertner about the pain he is having in and around his elbow at Bethesda Naval Hospital. Earlier in the day Gaertner had surgery on his arm. Gaertner was injured by an IED that was remotely triggered where he was sweeping for explosives in the Marja district of Afghanistan in November 2010. He lost his legs and sustained serious injury to his arm. Occupational therapist Joan Margulies holds Cpl. 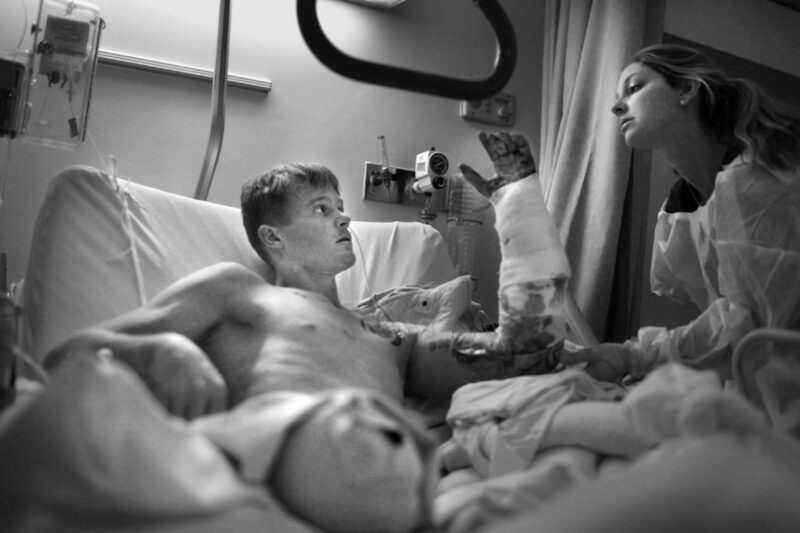 Justin Gaertner's arm still while it is being bandaged in a cast at Bethesda Naval Hospital. "When I got to the hospital I thought maybe it was just a giant hole in my arm," he said. "But there was nothing there except for skin and bone. No muscle, no fat. I was missing arteries and blood vessels." Justin underwent a series of procedures taking muscle, fat and artery from his stomach. Skin was removed from his leg and some bone was taken from his hip to reconstruct his arm. 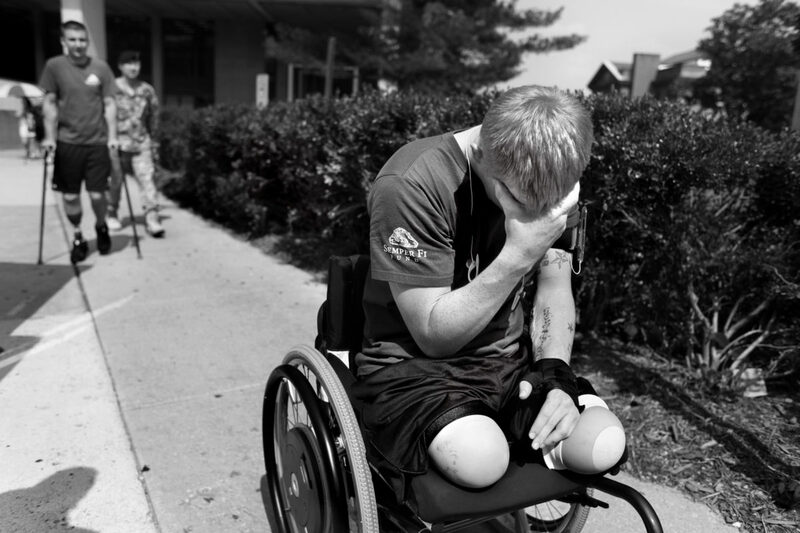 Justin holds his head for a moment after a morning workout at the MATC at Walter Reed Medical Center. "I'm never really gonna get used to the pain," he said. "I can over come it because I'm a marine. But it's always gonna be there." Justin Gaertner waits for his unit to return from Afghanistan at March Air Reserve Base in California. "I'm scared they're gonna tip me over they're gonna be so happy to see me," he said. Cpl. Justin Gaertner, left, is embraced by Cpl. 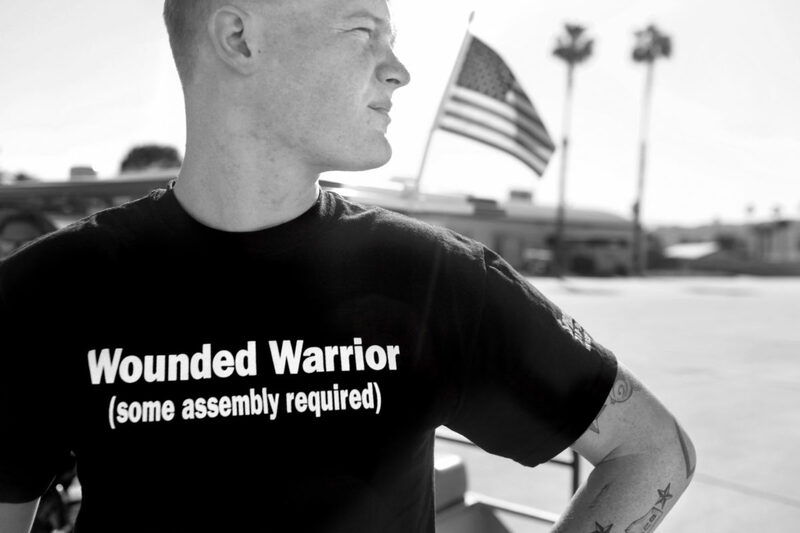 Austin Carter as his unit returns from Afghanistan to March Air Reserve Base in California. From the time he was injured by an IED in late November, Justin's goal was to be up on his prosthetic legs by the time his unit returned in early May. It usually takes above the knee amputees eight months to a year to be up and walking. Justin did it in four months. "Being able to see my boys come of the plane was my motivation to go in twice a day, every day," he said. "And even going on the days that I'm supposed to have off I still go in every day and PT. Physical therapy, occupational therapy, work on my arm, work on my legs." Justin said it was important that they see him standing strong. "I was crying as soon as I got away from everyone," Austin later said after seeing Justin waiting at the bottom of the plane. Many of his fellow marines said they thought daily of that day. "I always think of it, wishing I could have done more to prevent it," Austin said. Cpl. Justin Gaertner shows off his new legs to his unit just after they arrived at March Air Reserve Base from Afghanistan. Just after getting his new legs, Justin drew a Gumby on his left prosthesis, where he once had a similar tattoo on his amputated leg. He got the tattoo before his first deployment. "You've heard the term ' Semper Fidelis' always faithful? Well there's a term in the marine corps, "Semper Gumby' always flexible. "You're always running around, You're told to do one thing and then you have to do something completely different. Or you have five people telling you to do five different things and you have to do all of them within a short amount of time." 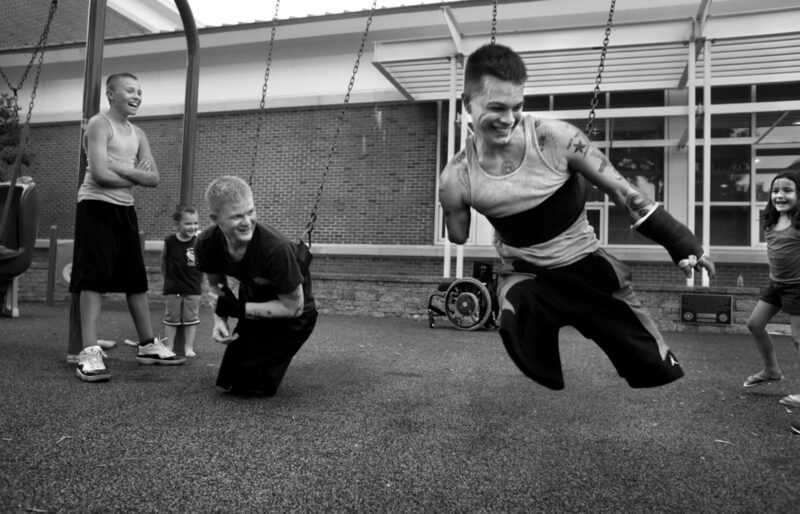 Larry Dalla Betta, 12, left, watches as his brother Justin Gaertner and Tyler Southern swing at a playground near the Malone House at Walter Reed Medical Center in Washington, D.C., in June 2011. "You always hear stories, when you're in Afghanistan, you always hear about guys in other units you know, 'Oh this guys just lost his legs.' You think this dude, he's done, he'll never be able to walk again," Justin said. "He's wheelchair bound for the rest of his life. Then you get to Bethesda and you have people like Tyler Southern coming in the room. It just totally turns everything around." Justin said Tyler paid him a visit while he was still in the ICU, and it helped him realize his life was not over. Larry Dalla Betta, 12, left, his little sister Nicole Dalla Betta, 6, and their mom Jill Dalla Betta watch TV as Justin looks at his iPad in his room at the Malone House at Walter Reed Medical Center. The kids were staying there for a couple of weeks after school was out for the summer. Since Justin was hurt, Jill became his Non Medical Attendant, leaving her younger children at home in Florida to be cared for by their dad. When Justin was initially hurt, Larry would express his feelings about his brother's injuries but doesn't talk much about it since. "Little Larry is going through the transition in life right now so he kinda keeps everything bottled up. Nicole shows her feelings and tells me her feelings and we talk about it. They both understand. They've seen their brother. They know their brother needs an extra little bit of help right now." Justin gets a hug from his aunt Cheri McPherson as he arrives at Tampa International Airport on May 14, 2011. "I'm really excited," she said. "I have not seen him. He's come a long way." 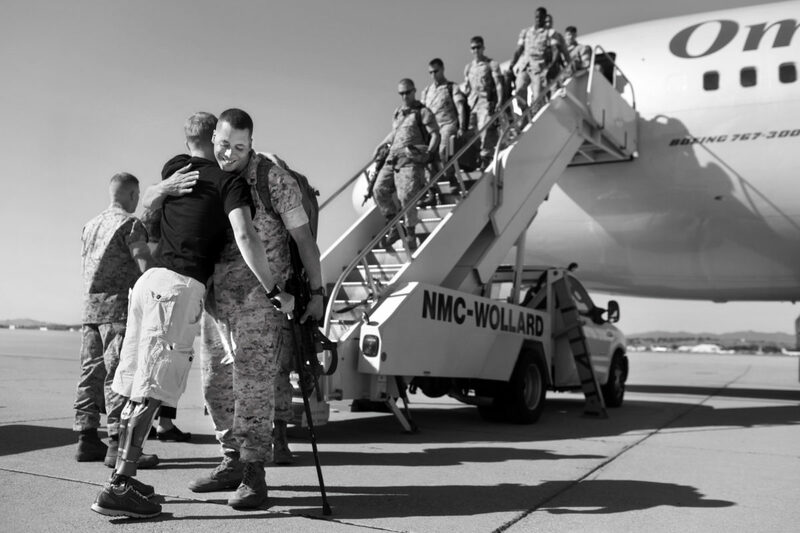 It was Justin's first visit home since he lost his legs to an IED in Afghanistan in November. After two weeks he will return to Walter Reed Medical Center to continue therapy. Along with family and friends, Justin left the airport in a limo which took them to a VFW in Trinity where a party awaited him. 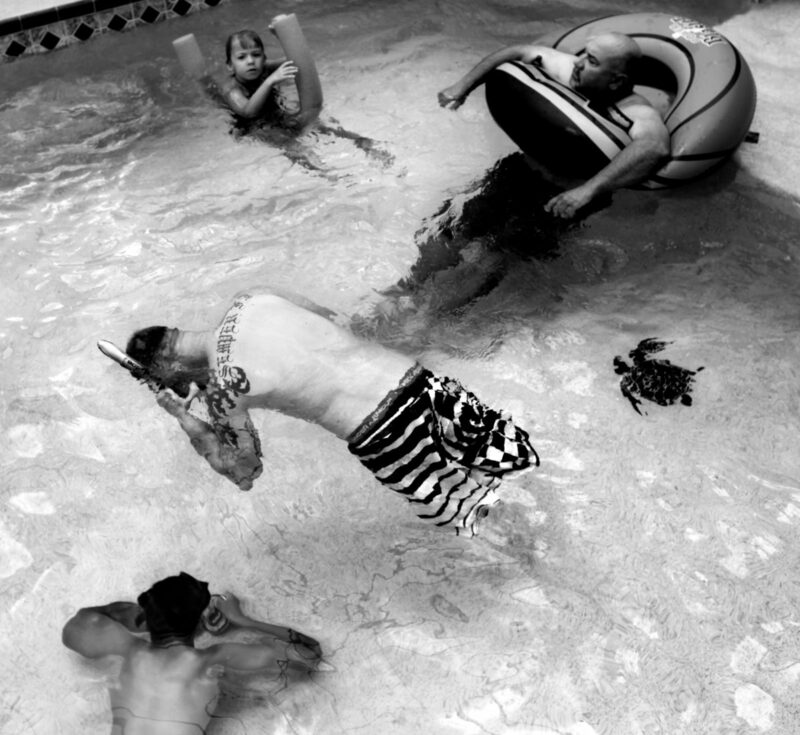 Justin Gaertner swims with his sister Nicole Dalla Betta, 6, step dad Larry, right, and brother Larry Jr, 12, bottom left, at their home in Trinity, Fla., in May 2011. Justin said swimming with his little sister was at the top of his list when he came home. 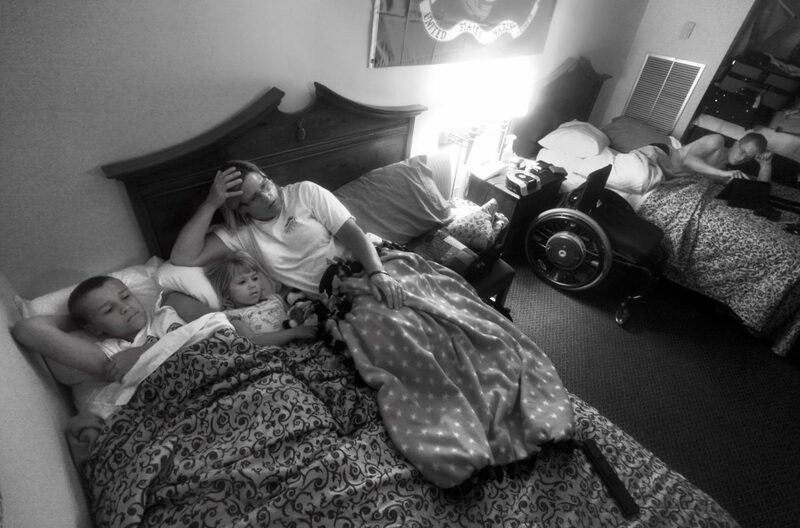 Nicole Dalla Betta, 6, sprawls out on her brother Justin's wheelchair at their home in Trinity, Fla., during Justin's first visit home since he was injured. "Nicole likes to push me around the house in my wheelchair," he said. "And she tries to help as much as possible." Cody McCasland, 9, of Colleyville, Texas, walks the 1-mile Fun Run with Cpl. Justin Gaertner in Clearwater, Fla., on May 21, 2011. The event served as a fundraiser for the disabled. Cody McCasland, became a double-amputee after being born without shin bones. 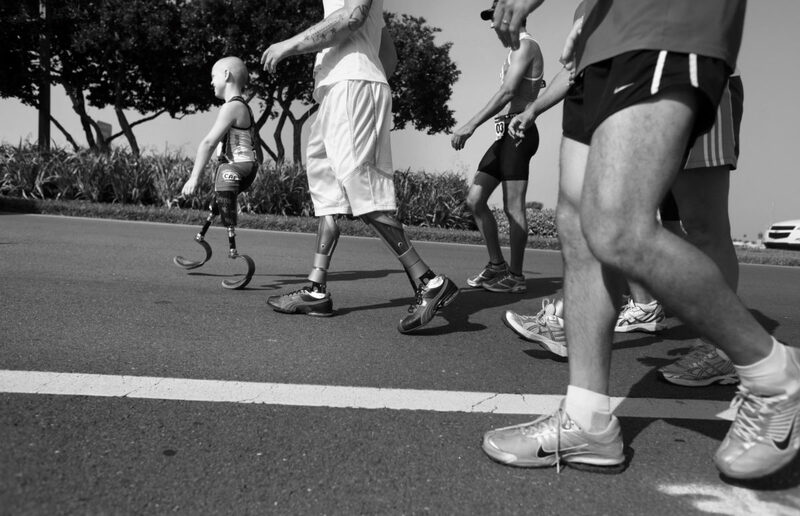 Walking a mile was the longest he had gone on his prosthetic legs up until this point. "He’s 9 years old he’s been walking like this forever," Justin said. "Even though he’s younger, I’m still looking up to him because he’s been walking way way longer than me. I’ve been walking 4 months he’s been walking 9 years so I’m looking up to him to see what I gotta do to push through the pain. He was pretty much an inspiration to me." Jesseca Willis carries Richeala Stevenson as she tries to protect her rear end from Justin Gaertner's forehand as they check out his new room at the barracks for wounded military members at the Bethesda Naval Medical Center campus. Todd Love and Josh Bouchard crowd in at the doorway. "When you get hit, unless you're already married you don't think you're gonna have a relationship again. You don't think you're gonna meet girls," Justin said. "I've met more girls since I've gotten hit than I did before I got hit. Because I was always shy. Now I'm really not that shy. You know everybody says, you only live life once, and i'm living it a second time. I don't have to come up with corny pick-up lines anymore. Girls come up to me. They just come up to me and they're like, 'Hey what happened?' And I explain it and there goes the beers." Justin Gaertner and Tyler Southern dance to Ludacris' "How Low" as Hurricane Irene passes over the area at the new barracks at Bethesda Naval Medical Center in August 2011. Justin had just moved in the week before and bought himself DJ equipment and a number of new appliances and decorations. "After I got hit, I decided, I was like, 'Man, I want to be a DJ,'" he said. "Sounds like a good idea. I mean, I love music, I love mixing stuff together. I love making my own beats." Marine recruits file past Cpl. Justin Gaertner at the Parris Island Museum in September 2011. Justin made a trip to Parris Island with a group of New York firefighters who delivered a piece of the World Trade towers for the museum. The last time he was at Parris Island, he was a recruit in 2007. Justin graduated from high school on a Friday and was headed to bootcamp on Monday. "He wouldn't even stay the summer," his mother Jill Dalla Betta said. "He just wanted to get right out there and get to business." Justin was excited to be back at Parris Island but his emotions were mixed. "It was kinda weird because it used to be me over four years ago," he said of seeing the recruits. "And it was also weird rolling by them, having them say 'Good afternoon sir' to me. That was a little un-comforting because we all put on the same uniform every day. We wore the same boots." 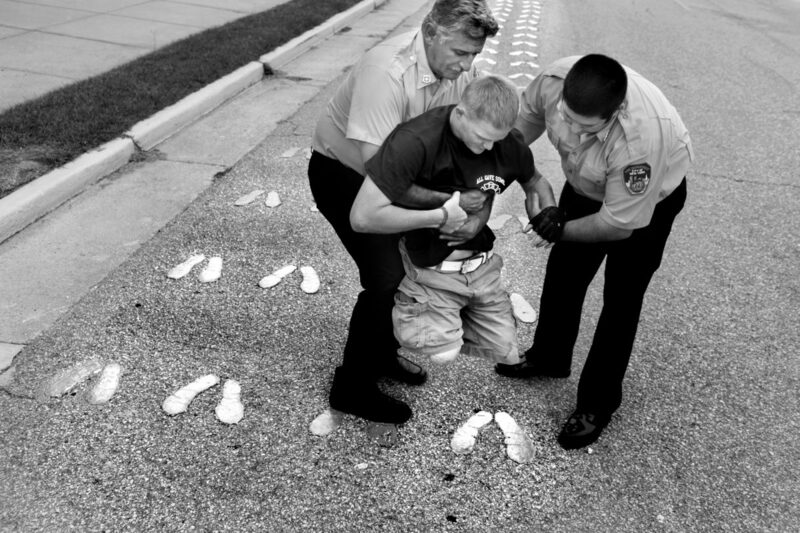 New York firefighters help Justin Gaertner sit on the yellow footprints at Parris Island, S.C., in September 2011. When recruits arrive at Parris Island for boot camp, they jump off a bus and line up in a formation on these footprints. It's the beginning of their journey. Justin made a trip to Parris Island with a group of New York Firefighters who delivered a piece of the World Trade towers for their museum. The last time Justin was at Parris Island, he was a recruit in 2007. Justin graduated from high school on a Friday and was headed to bootcamp on Monday. "He wouldn't even stay the summer," his mother Jill Dalla Betta said. "He just wanted to get right out there and get to business." Justin was excited to be back at Parris Island but his emotions were mixed. "It felt a lot different because four years ago I was there and I wasn't even a marine yet. I was still a recruit. 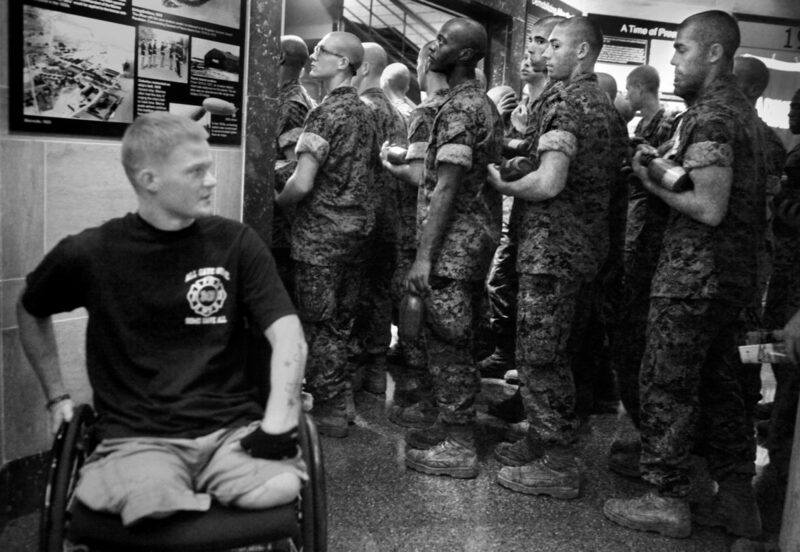 I was becoming a marine, becoming a man," he said. "I still had my legs so it was really weird. It kinda hit me in a soft spot, especially just looking around because i still remember everything." On the day after Thanksgiving, U.S. Marine Corps Lance Cpl. Justin Gaertner, 21, was patrolling for mines in the Marja district of Afghanistan when an improvised bomb, stuffed in a glass jug, exploded beneath his feet. His legs were decimated. Shrapnel blasted into his abdomen and shredded his left arm. He was eventually flown to Washington, D.C., where he began what doctors said would be a long and daunting recovery. 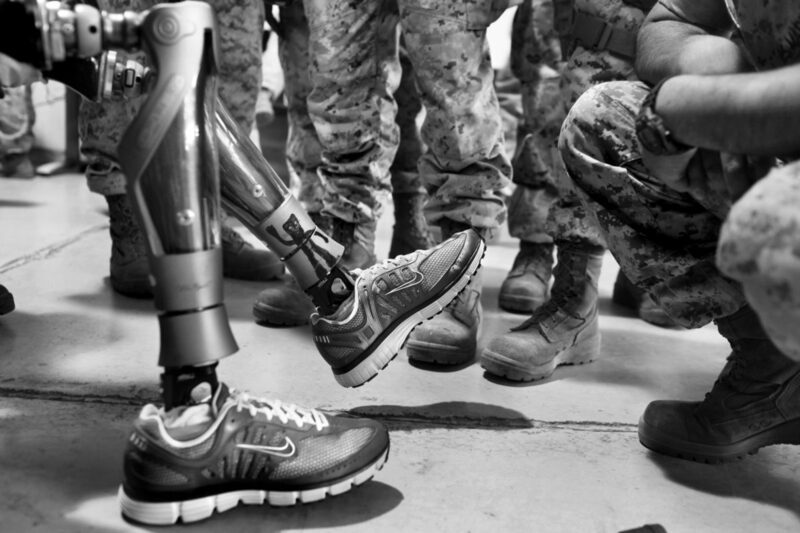 Of the 46,000 American troops wounded in a decade of war in Iraq and Afghanistan, more than 1,200 have lost a limb. 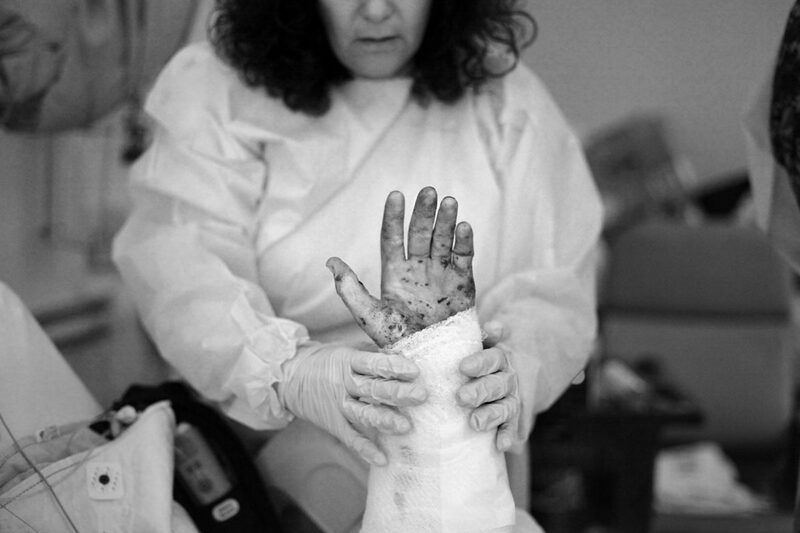 All of them face grueling treatments and uncertain futures as they return to life back home. A graduate of Trinity’s Mitchell High School, Justin had always believed the Marines helped him grow up. But that bomb, in an instant, had reduced him to a child: diminished, dependent, unsure. 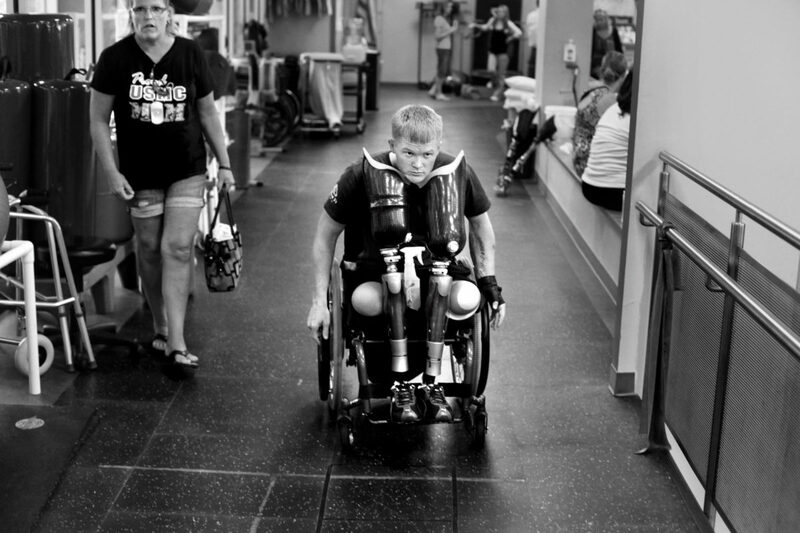 For him, adjusting to life without legs was about more than wanting to walk. How could he prove his strength to others, to himself? How could he, for a second time, grow into a man?